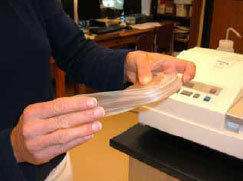 Parafilm is a flexible film, available in several different lengths and widths. 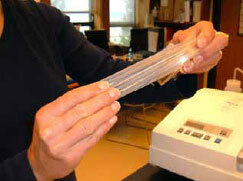 It is commonly used for sealing or protecting containers, like our Petri dishes. 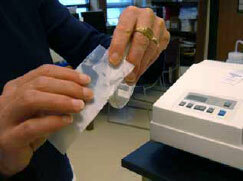 It will help to ensure that our samples do not become contaminated by outside substances. First, don’t get frustrated if the parafilm rips, and realize that this is a technique that improves with practice! Figure 3.38: Start with about 2.5 squares long piece. Peel off the paper covering. Image by Dr. Marisa Pedulla. 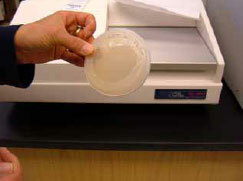 Figure 3.39: Holding the Petri dish between your thumb and middle, ring and pinkey fingers, use your index finger to pinch one end of the parafilm to the top and bottom of the Petri dish (covering the opening). Figure 3.40: Using your other hand and starting near the pinched end, stretch the parafilm evenly. Figure 3.41: Slowly rotate the Petri dish in your while continuing to stretch the parafilm. Figure 3.42: Continue rotating and stretching until the parafilm overlaps itself. Figure 3.43: Gently push on the overlapping parafilm to make a seal. 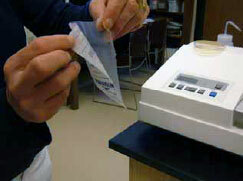 Have you noticed a decline in the quality of parafilm? It has changed such that I can no longer stretch the film like I used to….